We have discussed introduction to Constructors in C++. In this post, copy constructor is discussed. 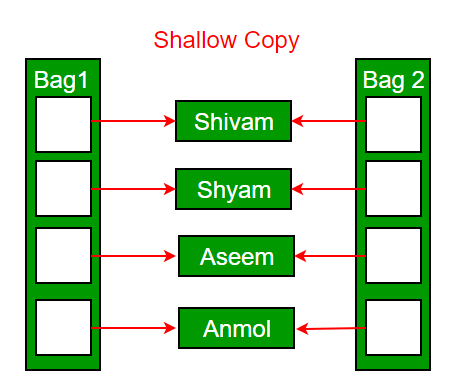 Following is a simple example of copy constructor. 4. When the compiler generates a temporary object. It is, however, not guaranteed that a copy constructor will be called in all these cases, because the C++ Standard allows the compiler to optimize the copy away in certain cases, one example is the return value optimization (sometimes referred to as RVO). When is user-defined copy constructor needed? If we don’t define our own copy constructor, the C++ compiler creates a default copy constructor for each class which does a member-wise copy between objects. The compiler created copy constructor works fine in general. We need to define our own copy constructor only if an object has pointers or any runtime allocation of the resource like file handle, a network connection..etc. Default constructor does only shallow copy. 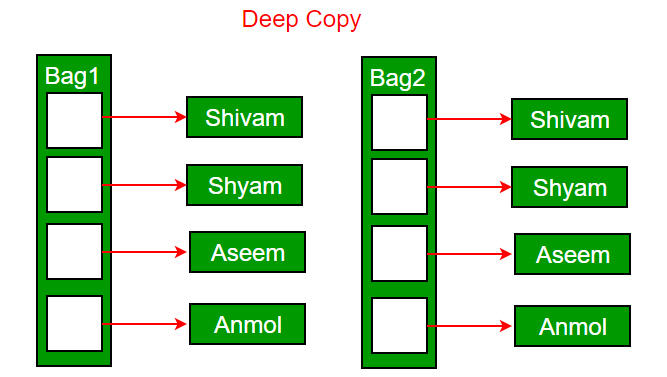 Deep copy is possible only with user defined copy constructor. In user defined copy constructor, we make sure that pointers (or references) of copied object point to new memory locations. Which of the following two statements call copy constructor and which one calls assignment operator? Copy constructor is called when a new object is created from an existing object, as a copy of the existing object. Assignment operator is called when an already initialized object is assigned a new value from another existing object. In the above example (1) calls copy constructor and (2) calls assignment operator. See this for more details. Write an example class where copy constructor is needed? Following is a complete C++ program to demonstrate use of Copy constructor. In the following String class, we must write copy constructor. str1.print(); // what is printed ? str1.print(); // what is printed now ? What would be the problem if we remove copy constructor from above code? If we remove copy constructor from the above program, we don’t get the expected output. The changes made to str2 reflect in str1 as well which is never expected. Can we make copy constructor private? Yes, a copy constructor can be made private. When we make a copy constructor private in a class, objects of that class become non-copyable. This is particularly useful when our class has pointers or dynamically allocated resources. In such situations, we can either write our own copy constructor like above String example or make a private copy constructor so that users get compiler errors rather than surprises at runtime. A copy constructor is called when an object is passed by value. Copy constructor itself is a function. So if we pass an argument by value in a copy constructor, a call to copy constructor would be made to call copy constructor which becomes a non-terminating chain of calls. Therefore compiler doesn’t allow parameters to be passed by value. Why argument to a copy constructor should be const? This article is contributed by Shubham Agrawal. If you like GeeksforGeeks and would like to contribute, you can also mail your article to contribute@geeksforgeeks.org. See your article appearing on the GeeksforGeeks main page and help other Geeks.